Ghanbari, S., Hajinejad, A., Rahmani, P. (2014). Formulating Strategic Plan of Medical Tourism Development. International Journal of Travel Medicine and Global Health, 2(4), 149-154. Sirous Ghanbari; Ali Hajinejad; Paeiz Rahmani. "Formulating Strategic Plan of Medical Tourism Development". 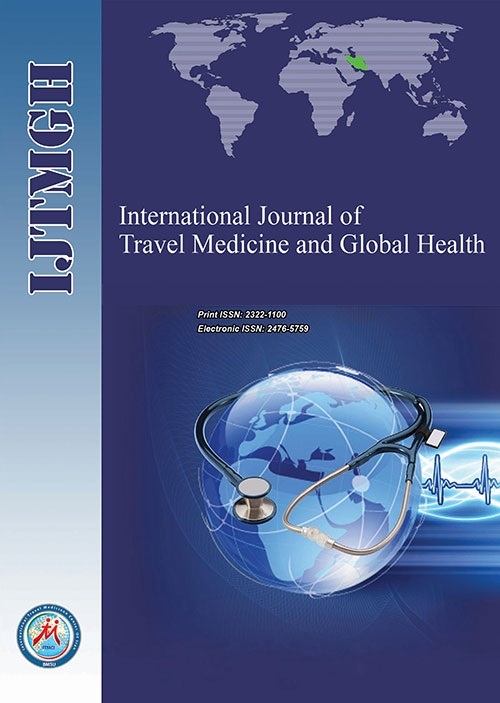 International Journal of Travel Medicine and Global Health, 2, 4, 2014, 149-154. Ghanbari, S., Hajinejad, A., Rahmani, P. (2014). 'Formulating Strategic Plan of Medical Tourism Development', International Journal of Travel Medicine and Global Health, 2(4), pp. 149-154. Ghanbari, S., Hajinejad, A., Rahmani, P. Formulating Strategic Plan of Medical Tourism Development. International Journal of Travel Medicine and Global Health, 2014; 2(4): 149-154. Introduction: Medical tourism is the travel of patients to outside the area of life to benefit from hospitals and medical services or some particular treatment or periodic test of physical conditions. This study has been done with the purpose of formulating a strategic plan of medical tourism development of Ahwaz city. Methods: The method of this research is a descriptive-analytical one that has been done by using a field of work and strategic planning methods for performing a backup analysis and delivering policies and strategies. Results: The results of the research indicates 16 strength points against 12 weakness points that results in earning the final score of 2.44 from the internal factors. Also, the numbers of 10 opportunities again 10 threats are recognized in related to medical tourism development of Ahwaz city. This has eventually leaded into earning a total final score of 2.8 from the external factors for medical tourism development of Ahwaz city. Conclusion: The results of applying the strategic planning method indicated that the city of this case study is having relatively higher opportunities and strengths in compared to the weakness points and external threats for the development of medical tourism. Thus, growth Strategies (SO) have been considered as a priority for the development of this part. Also, studies show that the lack of adequate and sufficient publicity and problems in the exportation of visa and also the lack of planning and cooperation and coordination in between the parts related to the absorption of medical tourism are problems that must be solved. Aniza I, Aidalina M, Nirmalini R, Inggit M, Ajeng T. Health tourism in Malaysia: the strength and weaknesses. J Community Health. 2009;15(1):7-15. Helble M. The movement of patients across borders: challenges and opportunities for public health. Bull World Health Organ. 2011 Jan 1;89(1):68-72. Hajinejad A, Eslamfard F. Formulating Strategies for the Development of Treatment Tourism in Shiraz (Iran) Using a Strategic Planning Approach (SWOT). Journal of Rafsenjan University of Medical Sciences. 2013;12(8):641-54. Persian. Spasojevic M, Vukasin S. Modern medical tourism as a market niche of health tourism, Economics and Organization. 2010;7(2):201-8. Bayati S, Haghshenas M, Esmaeili T, Abhari S. Consideration the place of Iran in attraction of medical tourism in compared to the Persian Gulf Countries. The First International Conference on Tourism Management and Sustanible Development (TMSD). Marvdasht Fars Iran, 2011. Persian. Pocock NS, Phua KH. Medical tourism and policy implications for health systems: a conceptual framework from a comparative study of Thailand Singapore and Malaysia. Global Health. 2011 May 4;7:12. Heung V, Kucukusta D, Song H. Medical tourism development in Hong Kong: An assessment of the barriers. Tourism Manag. 2011;32(5):995-1005. Courtney L, Valverde L. Potential impacts of medical tourism on health care in Costa Rica. Institute de Investigations Socials. Universiade de Costa Rica, 2010. P.1-10. Documentation existing in Ministry of Health and Medical Education. Tehran: Cultural Heritage Organization; 2008. Persian. Jabbari A. Designing the pattern of medical tourism in Iran. Thesis. Tehran: College of Medical Information and Management, Iran University of Medical Sciences; 2008. Monazam K. Reports of studying the existing literature and experiences of other Countries about medical tourism and presentation the strategic for country. Tehran: Researches Center of Parliament, Office of Social Studies; 2009. Ferdosi M, Jabbari A, Keyvanara M, Agharahimi Z. A systematic review of publications studies on medical tourismy. J Educ Health Promot. 2013; 2: 51. Laing J, Wray M, Brown G, Howat G, Weiler B, Trembath R. Health tourism in Australia: Supply, demand and opportunities. CRC for Sustainable Tourism; 2010. Chun AC. Using DEMATEL method for medical tourism development in Taiwan. Am J Tourism Research. 2012;1(1):26-32. Crooks VA, Turner L, Snyder J, Johnston R, Kingsbury P. Promoting medical tourism to India: messages, images, and the marketing of international patient travel. Soc Sci Med. 2011 Mar;72(5):726-32. Liu I, Chen CC. Cultural Issues in Medical Tourism. Am J Tourism Research. 2013;2(1):78-83. Borojeni H, Shlbafian A. Applying SWOT in analysis of medical tourism (case study: Islamic Republic of Iran). Tehran: Central of Science Cultural Tourism of Iran Students; 2011. Persian. Neil L. Medical tourism: Treatments, markets and health system implications: A scoping review. OECD: Directorate for Employment, Labour and Social Affairs; 2012. P.18. Mousavi M. Application model in geography with emphasis on urban and regional planning. Tehran: Publisher by Science and Religion; 2006. Persian. Yaghfori H, Eslamfard F. Consideration of flower tourism development in fars province with emphasized on Nargeszar of Kazeroun used by SWOT. International Congress of Tourism Development. Fars. Marvdasht, 2011. Persian. Tourism New Zealand. Tourism New zealand Three Year Marketing Strategy FY 2014 – FY 2016, 2013. Janson Y, Sim S, Nelson N. Medical tourism: The Asian chapter. Available at: at:Http://www.healthtourisminasia.com. 2008. Accessed 27 June. Mohammadipoor F, Rahimikia A. Medical Tourism: Emerging phenomenon in healthcare. Conferences of Natural Geography Application in Environmental Planning. Khorramabad Azad University, 2010. Persian.